My father, Glenn Randall, reminded me just before David and I left on vacation last night, how much he and my mom had loved it here when he shot the opening sequence to Raiders Of The Lost Ark in 1981. I had almost forgotten...and how could I (!) when the very name of my design firm was inspired by that iconic film. What an impression the whole experience of that movie and my family's involvement had on me at the tender age of 14. Dad's contribution landed him an invitation to The Motion Picture Academy. And I remember Steven Spielberg hanging out at our ranch discussing all the particulars of the coming shoot and Harrison Ford showing up for weekly riding and rope lessons from Dad, the consummate cowboy. 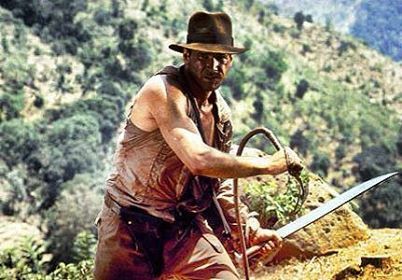 Ultimately Indiana Jones, that brilliant swashbuckling stud, influenced my own sense of wonder and adventure. His nerdy capable athletic brand of academia struck a chord within me - smart and tough and AWKWARD.....Awesome! And the exotic cultures and historic lore of his world mesmerized me. In 1990 Interior Archaeology was born...yes, just a mere interior design firm, but a with an unabashed, unapologetic love of history, cultures, and detail. Next on my travel dossier - Morocco, where they filmed the fight scene with the saber and the pistol... haha! Back where it all started - priceless!